Wow! What an amazing perspective on such a horrible situation. Elizabeth's mom couldn't have given her better advice upon her return. A fantastic and triumphant return from the depths of hell. Wow! This young woman tells an amazing story. She looked evil in the face and recognized it for what it is. It is horrifying to think of the abuse she endured. Her strength and courage is truly inspiring. Her ability to not let this horrific event define her is incredible. 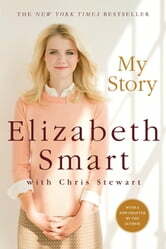 Elizabeth Smart is a role model to look up to and admire! I thank her for reaching out to share this extremely intimate event with us and to show us how to find courage and strengthen our faith. I follwed her story right from when she was abducted and prayed for her return and was so happy when she was found. I just finished reading her story and it brought tears to my eyes and i had to finish it. What an experience! Please read this book! Elizabeth Smart is one of the most beautiful young women I've seen or heard about. Her faith is so pure and sweet and wise. Obviously her family's input into her young life has helped create such a fantastic woman. She writes so beautifully about the reality of her experience. Her life story can help anyone of any age.